Geloon specializes in the manufacture of hair tools across all levels of the spectrum – from basic flat irons, hair dryers and curling wands to complex, feature-full products. Geloon has abundant experience to do custom hair tools project, including custom flat irons,custom curling irons,custom hairdryers etc. To achieve the high level of quality required for our products, we’ve worked hard to develop a core team of engineers, designers and manufacturing specialist who really know how to create great products. All of our manufacturing is done in our own factory under strict quality conditions. We inspect the quality of our manufacturing at every stage of the production line and work hard to ensure that no sub-standard products ever leave our factory. If and when we source components from third party manufacturers, we only purchase from experienced, proven suppliers, who conform to the high standard of manufacturing that our clients expect. We inspect incoming inspections in order to ensure that the quality of the components in every shipment remains consistent. At the end of production, every single product (including its packaging and accessories) is inspected by us to make sure that when you receive the products, you are fully satisfied. 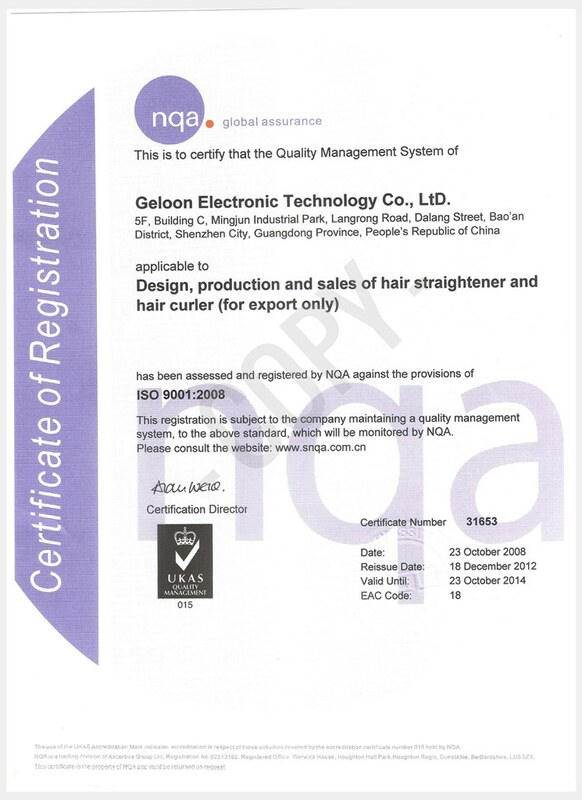 Geloon is Israeli-Chinese owned, and managed according to procedures accepted by western companies. The company has invested considerably in selecting professional and reliable employees and instilling the awareness of service and organizational culture based on the values of responsibility, reliability and confidentiality. Geloon has strict procedures for protecting production files and prevention of disclosure of clients’ information. First Generation, lots of experience! At the time Geloon Factory was established, there were about 38 hair tools manufactures all over China.